It was barely dawn as I grabbed my bag and headed out the door yesterday morning. I had an ambitious morning planned despite carrying around this cold for the last few days. I pushed myself to get up and out early because I had a coffee date with a sweet sister in Christ. Most days we are catching interrupted moments for words through cell phones and texts as we race through days of Home -School, sometimes part time work, volunteering and generally momdom moments in daily life. But to see her face, sit in her presence and behold her in my heart…over a hot cup of brew at Starbucks, no less, well that is truly a rare and beautiful gift! Additional gifts God gave along the way – mysterious large snowflakes (manna for the morning, reminders of His grace) falling as I pulled out of my driveway- which stopped shortly after and a glorious orange sunrise (which when I pulled over to photograph found my camera battery dead). I thanked God for these gifts. There we sat in our comfy chairs beside still waters (of the caffeinated persuasion) talking of all He has been doing in our lives, sharing our our struggles…a moment of rest in the blur of the day. *PS about the lamb: As I ran out to the garage to head to Starbucks, a box of my daughters stuffed toys was right near my car door and for some reason I spotted the little lamb and thought of my Good Shepherd, I scooped it without even thinking and threw it in my bag. That little stuffed reminder in my bag gave me a smile for the rest of the day. And a fun picture at Starbucks! **Forgive my long post this morning- feeling silly, blissful blessed- and sniffly! ***Seriously finding rest in friendship this week on every side! The revised version of Psalm 23 verses and added commentary went beyond 5 minutes but I was having a giggle moment of additional writing bliss. Grateful for our Friday Writing time here at Lisa-Jo’s! Stopping over from Lisa Jo's! 🙂 LOVE that you can find time to rest with a good friend!! Love this so much! The lamb and pic brightened my day a lot! ha a cute lamb and def a nice reminder to keep with you through out the day….sounds like it paid off for you as well…smiles. 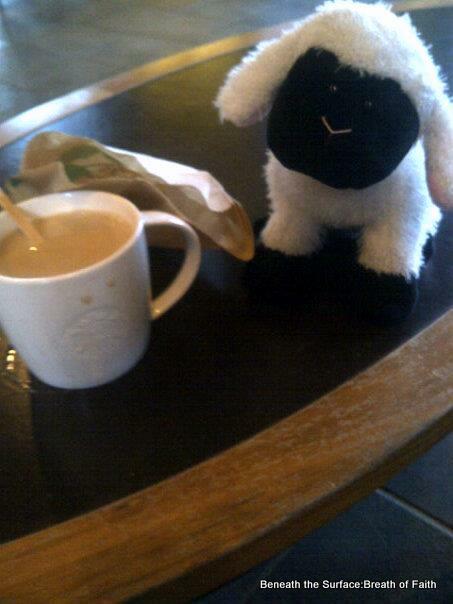 awww that was great Dawn and I love the little lamb! Haha, love your revised version of this Psalm.. So nice to have time with friends!